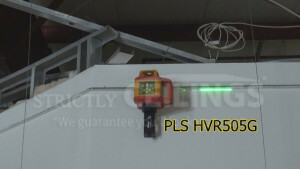 If you want to make that drop ceiling installation job a little easier, then you need to purchase a laser level. A laser level is going to save you countless hours guessing where the location of heights will be. There are several different kinds of lasers on the market today for drop ceiling installations. The two main types are rotary lasers and continuous line or non-rotary lasers. Both of these are available with either the red or green beam. We use PLS lasers because we feel they are higher quality than most other lasers. We’ve been using lasers for over 20 years and have field-tested most brands. 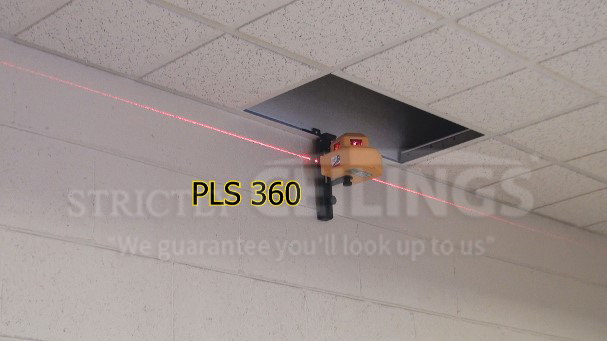 Let’s look at the uses of a laser for installing suspended ceilings. For installing the wall angle. There’s no faster way to install wall angle then with a laser. Install the laser so that it runs just below the angle and fasten the angle on with nails or a cordless staple gun. For leveling the ceiling. The laser projects a beam that is perfectly level and you’ll use this for leveling main runners. You can adjust the beam so that it runs just below the grid or you can run 2” below the grid and use a laser card. For installing rows of support wires for the grid system. You can measure off the walls on both ends of the room and set the laser on the floor. 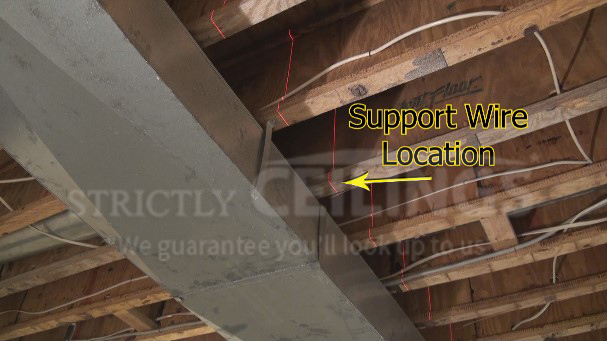 The beam will then project on the floor joists or deck and you won’t have to measure for every wire. For building ceiling drops. Install the laser on the bottom portion of the drop, install your lower angle pieces and cut all your tees to the laser beam for a perfect looking drop. For lining up slots on subsequent main runners. Many times we use a string line for this, but sometimes that isn’t practical and the laser is able to project around objects that a string cannot. Now… there are 2 different types of lasers for drop ceiling applications. The continuous line laser or non-rotating laser. You would use the rotary laser if you had a larger room to do…say around 1000 sq. ft. or larger. Rotaries project the beam much further than the pendulum lasers but are a bit more bulky and cost more. You can purchase a rotary with either the red or the green beam technology. Red is great for all around applications and green is great for long distance runs like hallways. The green beam can even be seen in rooms where the sun is extremely bright. The tradeoff is that the battery doesn’t last as long with a green beam. The continuous line lasers are great little lasers for small rooms, no more than about 800 sq. ft. or around 40’ x 40’. They are more suitable for small rooms as the laser beam cannot project as far and becomes very wide and inaccurate at long distances. They are faster to set up and are better in some applications because they project a continuous beam around the room. For almost all residential and most commercial applications, a continuous line laser would work just fine. Chose the laser that best fits your needs.